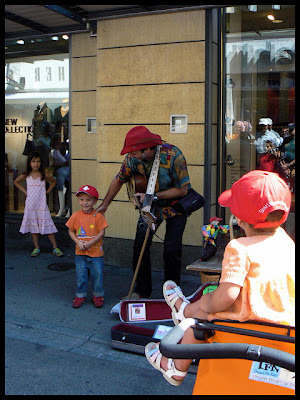 Balloon-figure maker, puppeteer, singer, musician, busker. 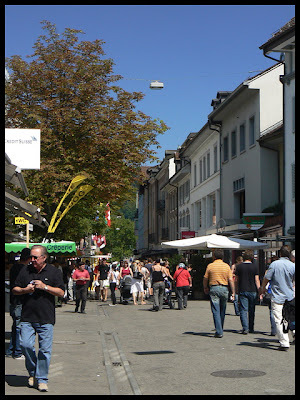 His monologue was a mixture of American English and heavily accented Swiss-German dialect. Very peculiar! The clump of people is the crowd around the balloon-maker. Notice the beautiful blue sky. It's been gorgeous this weekend. So, why am I indoors, writing blog posts?! One more photo for the day, and I'm off. 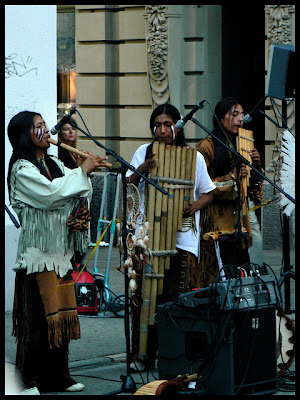 One of at least three Native American groups busking on Badstrasse.